One of the earliest obtainable maps of New England. Shows Norumbega, the 'New England El Dorado'. 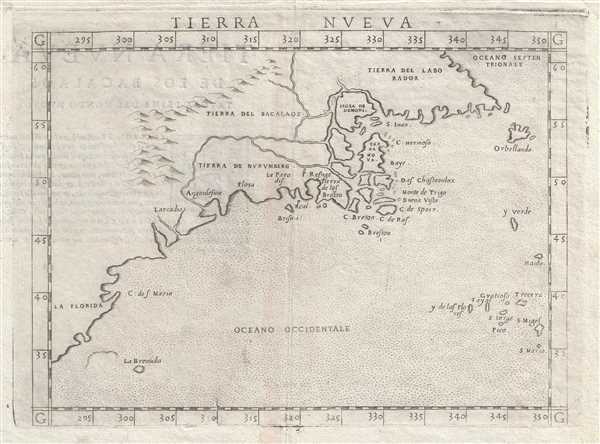 This is the first state, first edition, of Girolamo Ruscelli's 1561 map 'Tierra Nveva', an early and influential map of what would become New England and the Canadian Maritime Provinces. Though the cartography can be confusing by modern standards, the map covers the eastern coastline of North America from somewhere in upper Florida northwards past Cabo de Santa Maria to Larcadia (Kitty Hawk), Angoulesme (New York Harbor), Nova Scotia, and Labrador. Based on the Ptolemaic model, Ruscelli's work follows on the 1548 map of the same region by fellow Venetian Giacomo Gastaldi. Cartographically this map offers a fascinating look at early cartographer's attempts to reconcile the discoveries of Giovanni Verrazano with those of Jacques Cartier. Though there is some scholarly disagreement regarding the modern equivalent of the coastal toponymy, the general consensus is as follows, from south to north. Larcadia, named by Verrazano because of its forested beauty, is now assumed to have been somewhere near Kitty Hawk. In the subsequent decades Larcadia was moved further and further north until it came to refer to the coasts of Maine and the Canadian Maritimes. Angoulesme was the place name Verrazano gave to New York Harbor (although Andre Thevet, writing in 1550, also takes credit for the term). Flora is most likely the south coast of Long Island. Brisa is almost certainly Block Island. Pt. Refuge is Narragansett Bay. The Chesapeake Bay, Delaware Bay, Cape Cod, and Boston Harbor are notably absent, as Verrazano was forced too far out to sea for fear of reefs to see their entrances. Here it gets even more confusing due to the fact that this is where the discoveries of Giovanni Verrazano and Jacques Cartier almost but not quite meet. Verrazano was sailing north from the Carolina coast while Cartier sailed south from Labrador into the Gulf of the St. Lawrence. Given that Cartier never sailed south of Prince Edward Island and Verrazano barely skirted the southern tip of Nova Scotia, neither fully explored this region. But, we can make some guesses as to the place names. C. Breton is possibly Cape Breton Island or somewhere else in the eastern Maritimes. The mass of islands and rivers, with names like Isola de Dimoni (Island of Demons) and Terra Nova, is mostly likely a primitive depiction of the coast of Maine around the Penobscot River, Nova Scotia, Newfoundland, the Gulf of St. Lawrence, and Labrador. Labrador, here thus labeled as 'Tierra del Labrorador', is vaguely recognizable as it juts out into the sea. 'Orbellanda', a term derived from Arthurian legend, is similarly recognizable as Newfoundland. Both are clearly based upon Cartier's explorations. The river system extending inland both from the speculative St. Lawrence Bay (around Isola de Demoni and Terra Nova) and from Angoulesme (New York Harbor), thus joining the Hudson with the St. Lawrence, and at the same time embracing the mysterious land of 'Tierra de Nurumbeg', is a curious innovation unique to this map. The idea evolved from a more specific 1554 map of the confusing region between Angoulesme and Labrador by still another Venetian, Giovanni Battista Ramusio. Though his reasoning is unclear, Ramusio doubtless extracted his data from data associated with the second voyage of Cartier. Though incorrect at the time, Ramusio was remarkably prescient regarding the practicality of such a connection. Today a network of canals, including the Champlain Canal and the Chambly Canal, do indeed connect the two rivers, creating an important navigable corridor between the St. Lawrence and the Hudson. 'Tierra de Nurumbeg' itself is the fascinating highlight of this map. This mysterious land appeared on many early maps of New England starting with Verrazano's 1529 manuscript map of America. He used the term, Oranbega, which in Algonquin means something on the order of 'lull in the river'. The first detailed reference to Nurumbeg, or as it is more commonly spelled Norumbega, appeared in the 1542 journals of the French navigator Jean Fonteneau dit Alfonse de Saintonge, or Jean Allefonsce for short. Allefonsce was a well-respected navigator who, in conjunction with the French nobleman Jean-François de la Roque de Roberval's attempt to colonize the region, skirted the coast south of Newfoundland in 1542. He discovered and apparently sailed some distance up the Penobscot River, encountering a fur rich American Indian city named Norumbega - somewhere near modern-day Bangor, Maine. Though Roberval's colony lasted only two years, Andre Thevet, writing in 1550, records encountering a French trading fort at the site of Norumbega. A few years later in 1562, an English slave ship wrecked in the Gulf of Mexico. David Ingram, one of the survivors, claimed to have trekked overland from the Gulf Coast to Nova Scotia where he was rescued by a passing French ship. Possibly inspired by Mexican legends of El Dorado, Cibola, and other lost cities, Ingram returned to Europe to regale his drinking companions with boasts of a fabulous city rich in pearls and built upon pillars of crystal, silver, and gold. The idea caught on in the European popular imagination and expeditions were sent to search for the city - including that of Samuel de Champlain. The legend of Norumbega thus seems to have transitioned from Allefonsce's most likely factual description of a lively American Indian fur trading center, to Thevet's French trading fort, to Ingram's fabulous paradise dripping in wealth. Allefonsce's description of the American Indians he encountered in Norumbega corresponds well those of Hudson, who also met a tall well-proportioned people. Sadly only a few years later many of these tribes began to die off at extraordinary rates (over 90% of the population perished) due to horrifying outbreaks of small pox and other diseases carried by the unwitting European explorers. It seems reasonable that Allefonsce may have stumbled upon a periodic or semi-permanent indigenous fur trading center on the Penobscot. It also seems reasonable that French colonists may have set up their fur trading post at the same site, for it was fur, not gold that was the real wealth of New England and Norumbega. Alas, it was Ingram's fictitious account, which, though wholly the product of a drunken sailor's imagination, produced the most enduring image of Norumbega. Centuries later, in the 19th century, some armchair theorists, most notably Eben Norton Horsford, postulated based upon Allefonsce's descriptions and their own questionable research that Norumbega was a term derived from Norvegr (Norwegian), and that it was in fact a Viking city that Allefonsce discovered. We find this highly unlikely; however, Horsford's work inextricably linked Norumbega with speculations relating to Viking settlements in North America. Regardless of the truth of Norumbega, this map is an extraordinary find and one of the earliest obtainable maps of New England and the Canadian Maritimes. Published by Girolamo Ruscelli for this 1561 first edition of the Geography of Claudius Ptolemy, La Geografia di Claudio Tolomeo. Ruscelli, G., La Geografia di Claudio Tolomeo, (Venice) 1561. Very good condition. Text on verso. Plate mark visible. Burden, P., The Mapping of North America, #30. Kershaw, K. A., Early Printed Maps of Canada, pp. 22-23.